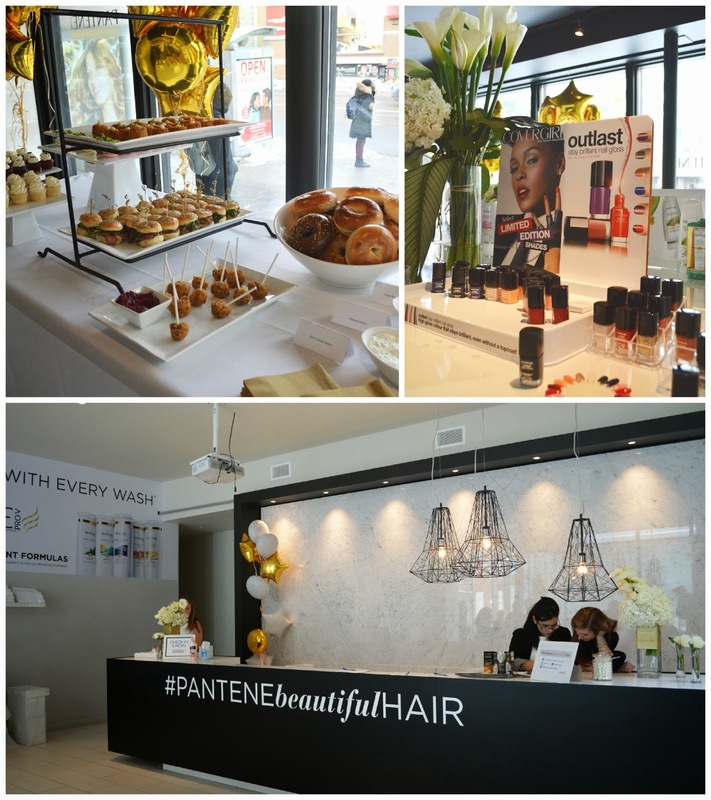 I was invited to attend the Pantene Beautiful Hair event hosted on Saturday at their popup salon in downtown Toronto. This event was in collaboration with Chick Advisor, one of Canada's leading sites for product reviews, local deals and general recommendations. I've been a member on the site for a few months now and was very eager to be a part of this experience. 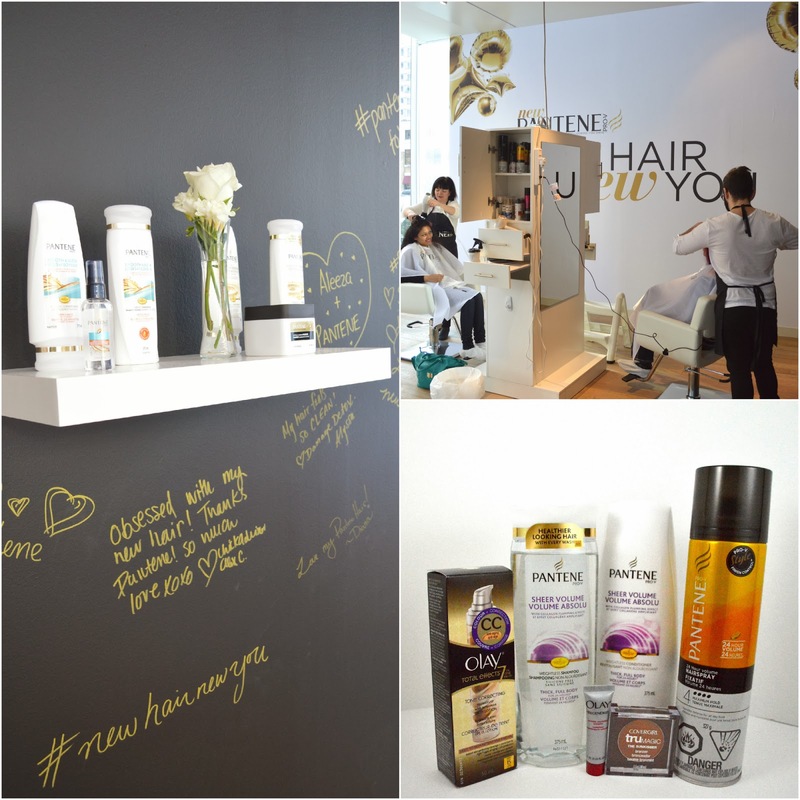 The event included a wash and blow-dry featuring Pantene's new and improved products. Some delicious food and drinks were also provided as we waited for our appointments. This opportunity came at the perfect time since I recently got 4 inches snipped off my hair and have been craving some new products to style my shorter 'do. Snacks, nail polish and the salon's checkin counter. This was the ultimate girls day. After completing the hair type questionnaire, I decided to try the "Sheer Volume" line from Pantene. Guests left with a very cute gift bag that included our new hair products and some other P&G products. The stylists were very sweet and I loved my completed look. The actual salon was beautiful, with cute decorative touches and lots of natural light filtering in. Pantene has reformulated their shampoos to "work with your individual hair needs to transform the hair you have into the hair you want". Their philosophy focuses on nourishing your hair to improve its natural appearance, through their Pro-Vitamin and antioxidant enriched formula. I haven't used Pantene in quite a while since I've recently been trying more high end shampoos. I am so excited to incorporate Pantene back into my routine since their new look and formulations are comparable to high end brands, without the hefty price tag. Here's to hoping that Pantene will soon provide more "clean" sulfate and paraben free products to satisfy the needs of all the green folk out there. Keep those locks clean with Pantene!